Who Created The Pragmatic Family of Frameworks? My career began at the age of 16 in 1978 as an Electrical and Electronic Apprentice with Marconi Radar Systems (Blackbird Road, Leicester, UK) At that time I was really into electronics and had been playing with little circuits for a few years. It was really exciting. I spent my time between college and “The Factory” where I got the chance to work in many different departments. It was really exciting. Around 1980 I ended up in a Department (New Parks, Leicester UK) called TEPIGEN (TElevision PIcture GENerator) who had built the visual system for a ship simulator. Six million Pounds of custom built hardware (that had less processing power than the CPU in the phone that’s in your pocket) consisting mainly of four racks of “Picture Processors” (Motorola 68000s) driven by a PDP11. It was really exciting. The output was on three channels each delivering 40 degrees field of view which drove three large Barco projectors. Interestingly at one point there were black speckles that kept appearing on the displays, moving about in random patterns and appearing and disappearing in the same apparently random fashion. After months of software and hardware investigation the problem was identified. It was a test Radar across the apron from where our Portacabins where located that was spraying us periodically with microwaves! It was really exciting. I began my time there hand entering the data which described the terrain and buildings and which fed the picture processors, and wrote my first program in DEC BASIC. Over the next four years or so my programming skills grew, and I moved from BASIC to FORTRAN and then to PASCAL. It was really exciting. The ship simulator turned into a flight simulator which meant it was the biggest video game in the world. It was really exciting. So much so that I would work late into the night (sometimes 48 hours at a stretch) and go into work on Saturdays or Sundays. Right from the beginning it wasn’t so much the code I wrote that I got excited about it was more HOW I wrote the code that interested me. I would often spend hours writing a program and finally get it working, only to tear it to pieces and rewrite it in a new and elegant way, often with more features, less code and more opportunity to reuse things later. It was really exciting. Even at that time I spent more time throwing things away than I spent creating things. I believe this is where progress comes from. Sounds totally counter-intuitive I know, but most things of value are counter-intuitive! Around 1986 the plug was pulled on TEPIGEN and I moved to another department (Fleet, Hampshire, UK) who produced a system called TELEVIEW (an improvement on Teletext and a forerunner of “The Web”) for Singapore’s Telecom Company (SingTel). I had moved on to C as a programming language. The most elegant and powerful language I have ever used. It took me a while to understand it but after reading the perfect “The C Programming Language” (Kernighan and Ritchie) the penny dropped. It was really exciting. A brief spell at SD Scicon (1989-1991) was followed by three years working for Deutsche Bank (Singapore) where I found the best food in the world and where my architectural tendencies came to the fore. It was really exciting. While there I created and sold a numerical analysis package for lottery numbers called Mega4D. Returning in 1994 I spent six years working for Eurobase Systems (Chelmsford, UK) doing Application Architecture and creating Architectural and programming frameworks. From 2000 to 2011 I spent my time working for various Enterprises as a contractor. While interesting, it wasn’t very exciting, but all the time, whatever domain I worked in I was always interested in improving it. Each time this met a limit and the limit was always as a consequence of things being done less than effectively and less than efficiently in the preceding step. Hence my roles moved from Application Architecture, Data Architecture and Technology Architecture into Technical Architecture (a bit of a misnomer!) then Solution Architecture then Enterprise Architecture and finally the entire Transformation domain. Since 2011 I have devoted my time to Pragmatic. It is really exciting. Whilst I have never been an academic person, and never went to university (I have always preferred to “go out and do stuff”) I have recognised over the last year that Psychology plays such a vital role in Enterprise Transformation (for good or bad) and so in February 2014 I began a BSc (Honours) Psychology degree with The Open University. It is really exciting. My MBTI is INTJ with a hallmark of Vision and categorised as Independent, Individualistic and Visionary. INTJs tend to be independent-minded, theoretical, and original. They have great drive for their own ideas and purposes. They are sceptical, critical, determined, and sometimes stubborn. In areas of expertise, they will develop systems to organize and carry through a project with or without help. INTJs are typically innovators in their fields. They trust their inner vision of how things fit together and relentlessly move their ideas to action. They would rather spend time on what they believe is important than on what’s popular with others. INTJs are independent and individualistic, and others may see them as stubborn at times. They move ahead with or without the support of others, and they have a single-minded concentration. They like using logic to solve complex, challenging problems. Routine, everyday tasks bore them. They analyse and attempt to fit pieces together into a coherent whole. Although INTJs are usually organized and follow through, they may sometimes ignore details that do not fit with their vision of the future. If these details are important, their ideas may not work as well as they would like. INTJs are likely to be most satisfied in a work environment that values their insights and ideas and lets them work independently. People can count on them for their vision and innovative solutions to problems in their field. ¨ Isaac Newton (Physicist) - "I can calculate the motion of heavenly bodies, but not the madness of people." ¨ Karl Marx - (Philosopher) - "Philosophers have hitherto only interpreted the world in various ways; the point is to change it." ¨ Augustus (Emperor of Rome) - "I found Rome brick and left it marble." ¨ Isaac Asimov (Science fiction writer and science writer) - "Those people who think they know everything are a great annoyance to those of us who do." ¨ Martin Luther (Theologian and Protestant reformer) - "I [am] slave to the authority of no one." ¨ Nikola Tesla (Inventor) - "My ideas have revolutionized the industries of the United States." ¨ Stephen Hawking (Physicist) - "My goal is simple. It is a complete understanding of the universe." My DISC Profile is 7414 and categorised as Result-Oriented. Result-Oriented people display self-confidence, which some may interpret as arrogance. They actively seek opportunities that test and develop their abilities to accomplish results. Result-Oriented persons like difficult tasks, competitive situations, unique assignments, and "important" positions. They undertake responsibilities with an air of self-importance and display self-satisfaction once they have finished. Result-Oriented people tend to avoid constraining factors such as direct controls, time-consuming details, and routine work. Because they are forceful and direct, they may have difficulties with others. Result-Oriented people prize their independence and may become restless where involved with group activities or committee work. Although Result-Oriented people generally prefer to work alone, they may persuade others to support their efforts especially when completing routine activities. Result-Oriented people are quick-thinkers, and they are impatient and fault-finding with those who are not They evaluate others on their ability to get results. Result ­Oriented people are determined and persistent even in the face of antagonism. They take command of the situation when necessary, whether or not they are in charge. In their uncompromising drive for results, they may appear blunt and uncaring. So putting MBTI and DISC together it says that I am a Result-Oriented Independent Individualistic Visionary. Well that about sums me up to a tee. Sounds very grand, but of course, there are always downsides. I am also an Arrogant, Inflexible, Argumentative, Intolerant, Impatient, Critical & Stubborn, Pessimistic Optimist! Different people have different profiles, and different profiles fit into different roles in different ways. We all kind of know this but do we ever take it into account? 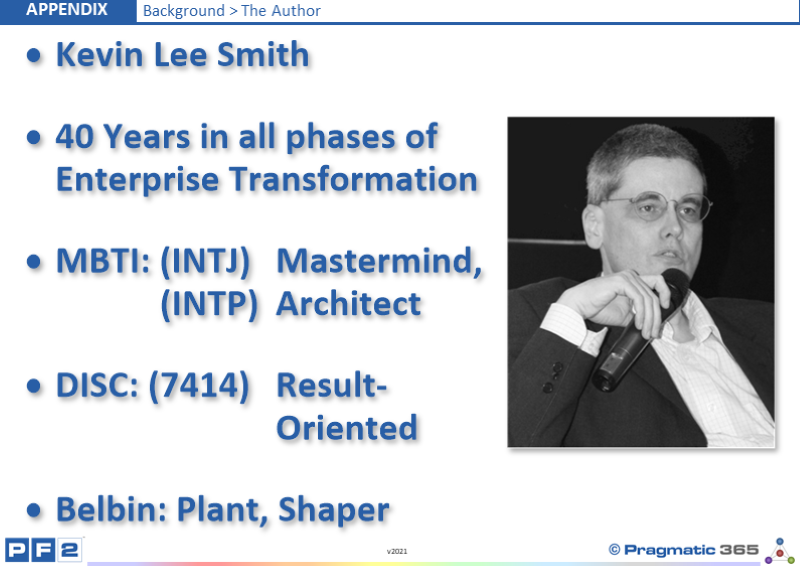 What are the MBTI, DISC and Belbin profiles of the people in your Enterprise? Do they all suit their roles? Have you ever found someone to be a “difficult person” or a “loose cannon”? If so, did their MBTI/DISC/Belbin profile taken into account?